A south wind has been hammering us for the last few days and is wearing our nerves but at least we’re not moving. The sea floor is rocky here and is providing excellent purchase for our “faux” anchors. The reality is that the two anchors we found in Paulatuk last week aren’t true anchors in the real sense but rather reasonable similes – one is a three fingered hook that once acted as a buoy anchor and the other simply two pieces of 1/2″ plate steel (roughly an iPad in length and width) welded together by a 1/4″ diameter steel bar. In a sandy sea bed they have a tendency of slipping, especially when its been blowing as hard as it has been but not today. Being stuck on anchor means lots of cabin time and everything that comes with that. Our cabin is approximately 6ft wide by 7ft long (roughly the size of a king size bed) and is 3′-6″ at the high point sloping to about 2ft at the far end. In this space we store all our personal gear including sleeping bags and matts, clothes and toiletries and all the other items we want close at hand like a book, an journal, a coffee cup and bowl, an iPod, a water bottle and maybe even a small flask of single malt. Add to this the essential equipment like the navigation panel, the electrical panel, a fire extinguisher, a large pelican case with all our communication equipment including two satellite phones, two Spot Check devices, two laptops and a huge assortment of cables and plugs and another smaller pelican case with our Nikon D600 SLR and accompanying telephoto lens and things start to get tight. 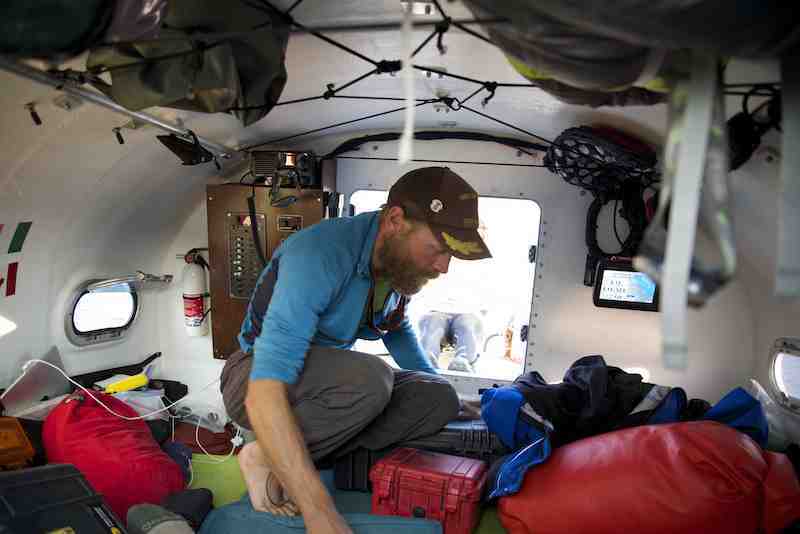 Arrange all this gear in the periphery of the king size bed and plunk down four reasonably big guys, unwashed and unkept, one or two slightly foul and all very tired and you begin to get a clearer picture of what it’s like in our cabin. 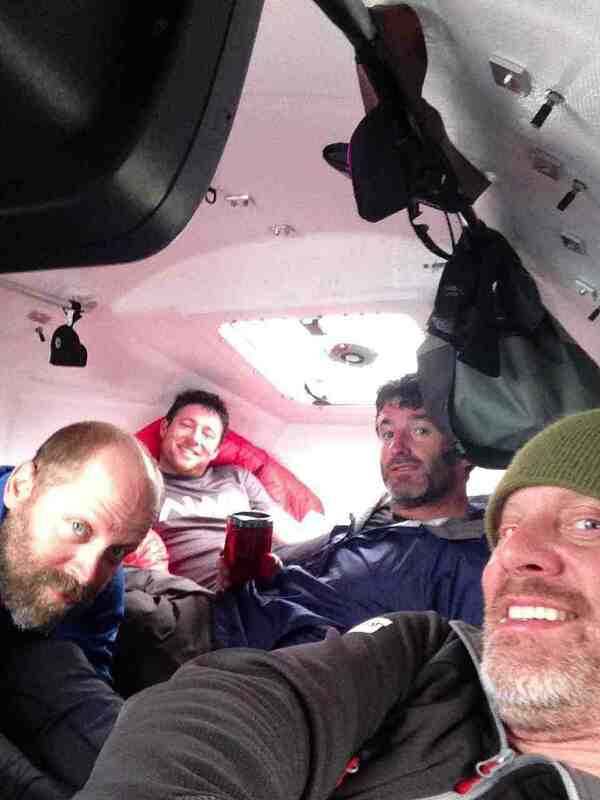 But all four of us are in the cabin only when it’s storming outside – otherwise two would be rowing – so take the said king size bed with all the gear and clothing on the periphery and the four jaded rowers in the middle and the start to shake it violently in every imaginable direction and keep doing it for hours and hours at a time. Now you likely understand why being on anchor can be a testing experience. This has been our lot for the better part of the last 36 hours. We’re looking forward to an easing of the wind. Our schedule for the last days has been row until evening, ride out a big wind until early morning and then start rowing again when the wind subsides. Frank and I start our shift this morning at 4:30am and move for several hours until we reach the decommissioned DEW line station at Tysoe Point. The landscape of this site is different than everywhere else, we can feel the hand of man has touched it. We pick up on it right away, slopes of land too perfect, gravel ridges too consistent in their shape and line, a barrenness too undeviating in its nothingness. Looking closer we spy pipes randomly popping out of the ground, like small chimneys no more than 4ft high, speaking to something beneath. There are two metal structures remaining on site, one like a small airplane hanger with a large overhead door that’s locked, the other a simple one storey shoebox its mandoor ripped open from the underside, the result of a bear no doubt, inside ransacked. A large block of concrete sits hundreds of meters away. It’s strangely disassociated with everything but bears a plaque commemorating the site. We make an effort to stop at such sites to get a better feeling and understanding of the Northwest Passage and its history. It’s just a quick hour break and we’re back at the oars. Within minutes we’re on anchor again waiting out another windstorm and this one has teeth. The wind comes from the south and is extremely warm. It holds a trace of smoke in its air and reminds me of the southerlies coming out of Paulatuk. The sharp snapping of the flags sound like whips and indicate a very strong wind, likely gusting over 35 knots. We begin to drag our anchor across the sea floor and we deploy the back-up anchor we acquired in Paulatuk. It works, we stop and ride out the storm. The wind eventually dies and Frank and I seize the moment and begin our shift. What we don’t realize is that this is our storm refuelling, taking a deeper more powerful breath before unloading another bigger blast. After 30 minutes of rowing it’s obvious that the wind is back. Strong gusts make movement difficult and we drop both anchors in 35ft of water. The wind builds. Our depth gauge and GPS on board make it very clear that we’re moving once again, out to sea. It’s not a fast march, just a few meters a minute, but we’re being pushed into deeper water. Our second anchor only has 60 feet of line and will soon loose purchase. We’re now relying on just a single anchor and the wind has built into a force we’ve not yet seen on this expedition. I can only guess but it must be gusting to at 40 knots or more. The boat is being tossed around like a cork and is slipping fast. We decide to throw our sea anchor to help stop the movement but it’s of little help. 3 anchors and we’re still not holding ground. We need to make a move. In times like these a little luck has a way of making itself heard and for us it’s an easing of the wind. We jump at it and decide to make a break for shore. Paul and Denis man the oars and Frank and I pull the anchors. I tie off with an emergency line as not to be swept overboard and scramble off the bow to retrieve the sea anchor. I need to use our ice poke-pole to recover it as we’ve run out of rope for a retrieval line. “100 meters to go” I lie, helping the boys keep a tempo higher than I think possible. We’re fighting this thing though, somehow. 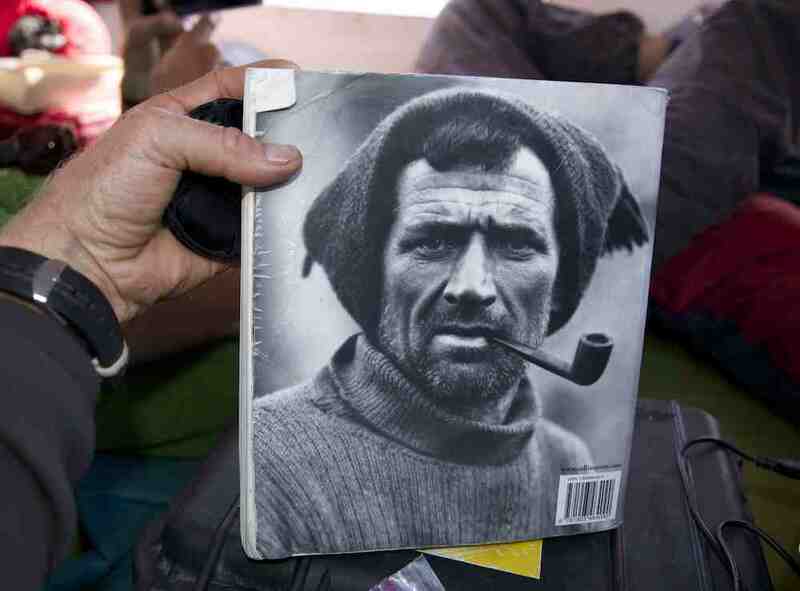 Tom Crean is a heroic Irish Antarctic explorer who was a member of both Scott’s and Shakleton’s Antarctic expeditions. He was one of the crew rowing the 22-ft James Caird on the 800-mile journey from Elephant Island to South Georgia in April 1916, arguably the greatest ocean rowing journey ever undertaken. After 30 minutes of frantic rowing we make shore. A large swell pushes the Arctic Joule onto the rocky beach. We hit our typical battle stations with Denis and I rigging an anchor and Paul and Frank fighting to keep the boat aligned. The wind has intensified to a level I can’t even guess at. The gusts are so intense that beach sand is lifted into a sandstorm. We attempt to set up our tent, a model designed for these conditions but within minutes it is flattened by a gust, one pole bending horribly, one pole snapping clean in half. We spend the rest of the evening tending to the boat as it’s perpetually washed up on the beach by the large surf. By 4:30am, 24 hours since starting our day, the wind begins to subside. Denis and Paul hit the cabin for a quick nap while Frank and I set up our sleeping bags on the beach to keep an eye on the anchor. It’s an odd scene, an endless gravel beach winding into the dust, two red sleeping bags in a straight line, foot to foot separated by a shotgun. Beaches are the pathways for the bears. We fall asleep to the buzz of mosquitos replacing the sound of the wind. A strong following sea out of Keats Point on the Amundsen Gulf pushes us playfully for several hours until it shifts and gets angry. Our ground anchor keeps us off the surf of shore and we tuck in until things subside. It’s 23:00 and a hand of cards and a little sleep are welcome. A bank of fog replaces the wind overnight and we pull anchor at 06:30 into a world of white blindness evocative of the writings of Josee Saramago. 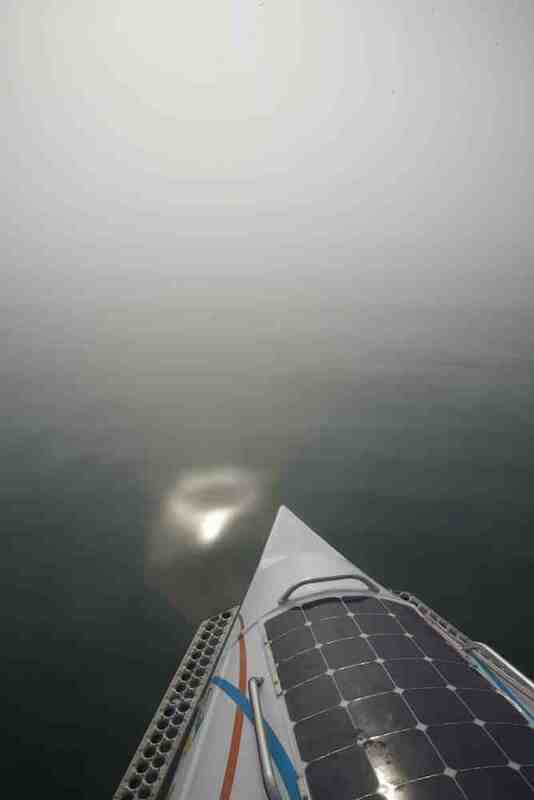 We glide across a vast ocean of arctic water but our world is contained and small, a tiny pond in a sea of mist. This sense of containment is something I experienced when skiing to the South Pole in 2008/9. The whiteness envelopes you and plays with your mind. It diminishes one’s scale of reference from the macro of the horizon to the micro of the fog bubble. An infrequent roller sweeps through our space and reminds us there’s an ocean out there. It’s a powerful metaphor for the arctic. Like the gentle oceanic swell moving through our bubble, the wave of climate change is born far away yet still makes its presence felt. The fog lifts and reveals a shoreline of cliff bands and steep gravel beaches. There’s little vegetation here just rock and stone in a myriad of forms. In one dramatic flourish a finger of rock extending out from land has collapsed to create an archway. The temptation is too great to ignore. Slowly our landscape has changed with rock wall banks giving way to low lying gravel beaches. 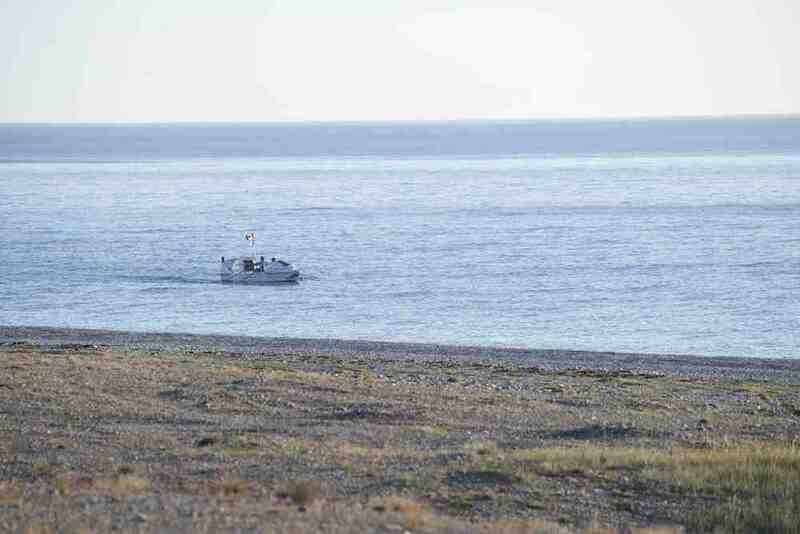 We travel close to shore trying to spot wildlife knowing full well that the beaches are the prowling grounds of big arctic critters: grizzly bears and polar bears. The shrinking ice of the arctic has given rise more frequent grizzly polar bear encounters and a strange new breed of bear. The polar bear descended from the brown bear thousands of years ago and still maintains enough of a genetic alignment that it can interbreed with a grizzly. With grizzly bears venturing further north these days (one was found recently on northern Banks Island) and polar bears finding themselves more and more stranded on land the inevitable occurs: the pizzly and the grolar. The name playfully reflects whether the mother or the father is the grizzly but the name is the only playful thing about this bear. Not ideally suited for either a solely land based or sea ice based existence this new hybrid species is very much on the cusp. Locals tell us they’re the meanest of the lot. The favourite food of the polar bear is the bearded seal and we’ve seen several in recent days. 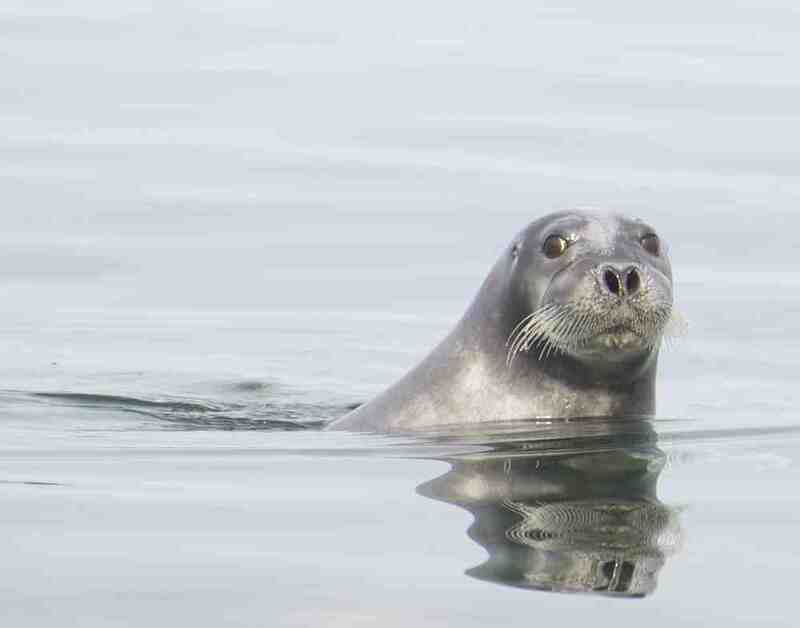 These inquisitive creatures follow our boat looking on us with sheer astonishment. One would think they’ve never seen an ocean rowing boat before. About 1am, the wind had picked up significantly and was definitely the strongest its been so far on the trip – my best guess is that this was at least a 40 knot wind (which is about 70km an hour) gusting even higher. We now had a problem – all 3 of our anchors (2 ground and one sea anchor) were deployed but despite this we were still been pushed out to sea towards Banks Island about 200km away. If we did nothing there was no immediate danger for us but if this weather persisted (as it was forecasted to for another 24 hours), we would potentially loose a lot of ground and be pushed backwards by the extremely strong wind. Given how hard we have had to work to make progress, the last thing we want is to be forced backwards. So we decided on a plan of action – wait for a lull in the wind, take in all 3 anchors and row as hard as we physically can to get to shore. Denis and I got ready to row and Frank and Kevin positioned themselves to take in the anchors. When we were all ready, the lads quickly pulled in all 3 anchors and Denis and I started rowing. I don’t think I’ve ever rowed as hard in my whole life; as we would say in Ireland “we gave it welly” for the next 30 minutes. At one point I did wonder if an oar would snap. I’m not saying this to sound all macho but we were putting so much pressure on the oars and the wind was so strong, I did wonder if an oar(s) would succumb to the pressure. 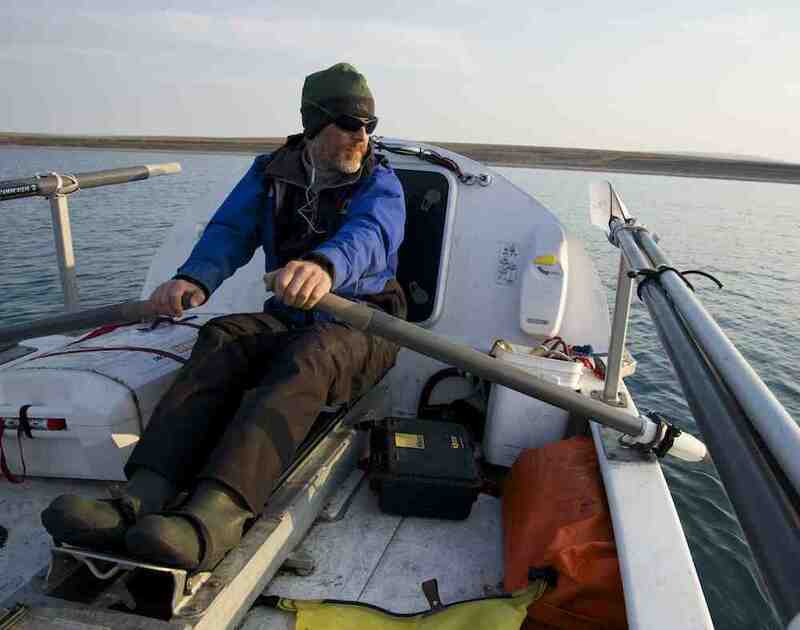 Fortunately the oars were fine and as we got closer to land, Kevin maned the steering wheel and kept us going with some great words of encouragement and we made land. With the adrenaline roaring through our veins, we set about securing the boat. We decided to set up the tent for the night instead of sleeping on the boat as the boat would be more secure without our weight in it. However Mother Nature had other ideas and the wind strengthened even more. This was nuts, one tent pole bent and another snapped such was the force of the wind so we had no choice but to stay on the boat. Just to make matters a little more interesting, the wind was now whipping up a mini sand storm on the beach. For the next few hours, we mixed our time between further winching up the boat onto the beach and sleeping – we were all exhausted. Originally all four of us were in the cabin. After a few hours Kevin and Frank slept on the beach and kept a watch on the winch gradually tightening it as the tide came in. Our main concern with being beached is the very real risk of damaging our centre board. Our centre board is like a retractable fin underneath the boat that greatly helps us with our steering and manoeuvrability of the boat. Although it is retractable, the banging on the gravel beach can still damage or jam it. If the centre board was damaged it would be virtually impossible to hold a straight line amidst the strong arctic winds. Shortly after 8am, things had calmed sufficiently and we pushed off the beach to continue on our way. Kevin and Frank rowed for about 2 hours before the wind whipped up again and stopped us in our tracks. 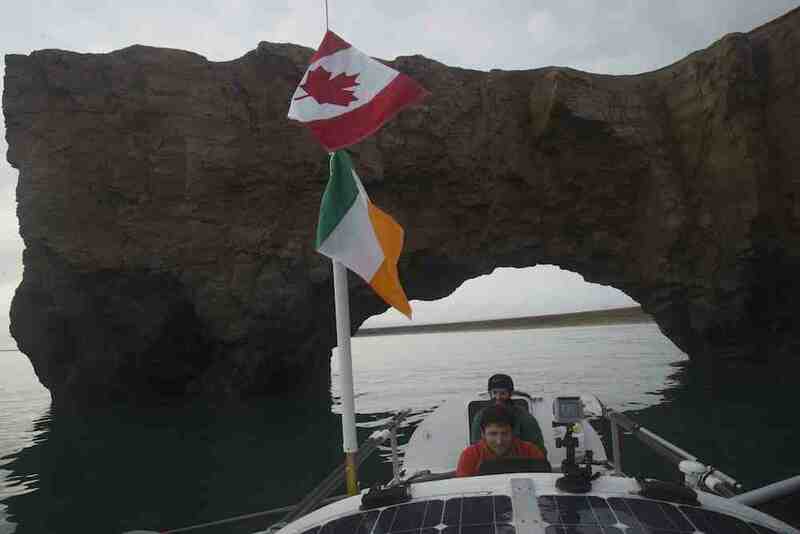 When we embarked on this trip, our intention was to rotate in pairs and row 24 hours a day weather permitting. At this point, we are fortunate if we can row for only 12 hours each day so we’ve had to change our daily expectations to the reality of what we are likely to get, which unfortunately are not conditions that right now enable us to row 24 hours a day. This has definitely proved to be a challenging “mind shift” to make for all of us. Hopefully we’ll get some good days of 24 hour rowing soon. So right now, it’s 11am and we’re on anchor again but at least we’re now holding our current position and are not going backwards. The last 12 hours have been very challenging but I do feel like we’ve had a little victory here (for now at least) as we avoided going backwards and actually managed to gain some ground over this windy period of tine,. There’s no doubt this is a tough expedition but we’re due a change of fortune with the weather so hopefully we’ll catch a lucky break soon – after all there’s a few of us Irish folk on this boat, aren’t we supposed to be lucky !!! The past couple days have been extraordinary. Disregarding a three hour temper tantrum it through around Cape Lyon last night, the wind has been behaving extremely well. We’re nervous though, mistrustful if you will, that the wind will turn when we least want it. Like parents with a disruptive child, we’ve grown accustomed to our blustery bundle misbehaving at exactly the wrong moment. We haven’t stopped rowing in over 36 hours, passing around Cape Lyon this morning. The very word cape instills trepidation in us as Cape Dalhousie, Cape Bathurst and Cape Parry all had something to share. 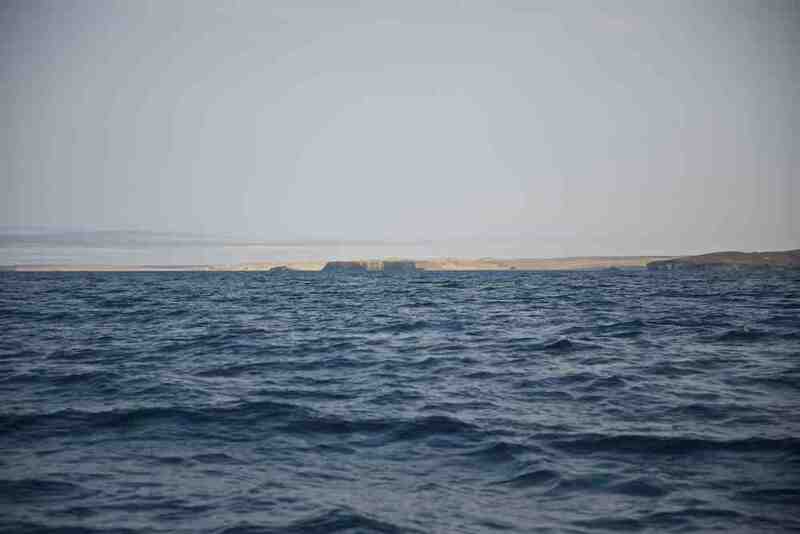 But Cape Lyon lies dormant, her 100ft face, precipitous and blank, a dark beast indifferent for now. The cape is nearly five kilometres in length and in a bad wind would be a very serious place to be. We don’t dawdle as we move through. The deep pulsating rhythm of an oceanic swell begins to be felt as giant rollers sweep beneath us, their direction oblivious to the wind and waves, a momentum born of some far off event. We’ve turned a corner in our expedition. We’re heading east, the big bays behind us. On dry land, I work as a performance coach. Essentially I work with people (both individually and within corporate teams) to enable them to enhance their performance in work and life in general. Through learning from others and based on my own personal experience, I think the simple act of creating space and time to focus on performance plays a huge part in achieving the outcomes people want in life. One of the books I just finished reading is called “The Power of Full Engagement” which was written by Jim Loehr and Tony Schwartz. Based in the US, these are two very experienced and knowledgeable performance psychologists who have worked in the area of human performance for over 25 years. In their book, they mention that one of the major things they do with their clients is to encourage them to slow down and take stock of their lives so that they can get a clear and impartial picture of their current reality. From there they can formulate a clear plan to achieve their desired outcomes and thus enhance their overall performance in their life. Making time for this sort of self reflection and analysis is obviously a challenge for most of us amid the business of our regular day to day lives. However for all of us on the boat, we have vast amounts of time on our hands. When Denis and I row, sometimes we chat and sometimes we listen to our music or audiobooks. As we finished our last shift earlier this morning, I was in a contemplative mood, the fog was quite dense, we were making good progress and I had some stirring classical music playing on my iphone. All of these combined had the the mind wondering in all sorts of directions. It was around this time that it struck me how fortunate we all are out here. We have all the time one could ever need to think about whatever it is we want to ponder. For me, the vast amount of space and time has really sparked my creative juices for things I want to do after this trip, new dimensions I want to bring into my work and also some really simple enhancements I want to make in my own life when we finish the expedition. So while we’ve definitely had some tough times on this trip so far, I do feel quite fortunate to have the gift of this space and time. Anyway, this was something that went through my mind today that I thought I’d share. Time for another freeze dried meal ! !